One thing I really need to start working on is teaching my sons how to care for the Earth. While my twins are still a little young to understand, my 4.5 year old certainly can. So we talk about recycling but really not much else, I just don't know where to begin or what to say. The folks over at FocusBloom have put together a great product that I think will definitely help with this! "I Cherish Planet Earth is about appreciating and preserving nature and our planet. It is a celebration of Earth’s life and beauty. It is an inspiration to learn about and care for all life, from the tiniest flower to the greatest forest. It is a natural addition to any go-green program, at home, neighborhood, school, or other community." 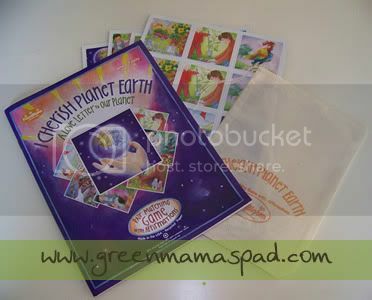 I Cherish Planet Earth is a pair-matching game as well as a full-color book. Included is 48 game pieces each containing affirmations such as "I respect the ocean", "I plant a tree" and "I conserve water." Included is a cotton bag to store your game pieces in. The book, "A Love Letter to Our Planet", is filled with the same colorful pictures that you will find on the game pieces and some lovely writing. The end of the book also gives ideas on how else you can play. 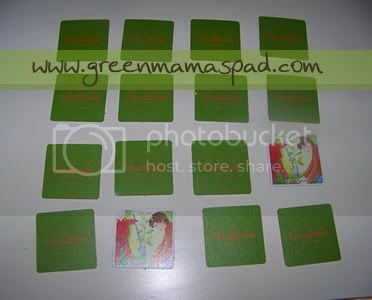 What is also great about this set is that the game pieces are printed on recycled cardboard, the book is printed on recycled paper and both are printed with vegetable oil-based inks. FocusBloom is also a member of 1% For The Planet and donates 1% of all sales. "I can help protect you, Mother Earth. I can listen, read and learn, and make changes! Where there is pollution, I can give you what you need. I want your air to be clean and your water and soil to be healthy. Even the smallest can help clean up!" I particularly love that last line because it is so true. The smallest child can clean up. The smallest changes we make can make a difference. I Cherish Planet Earth is made in the U.S.A. and is recommended for ages 4+ up. 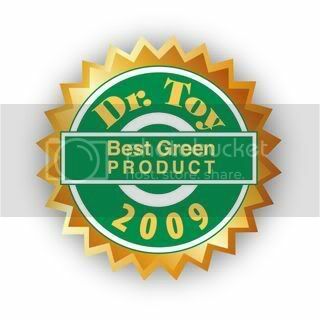 It won the 2009 Dr. Toy Best Green Toy Award. This set would make a great gift for the child in your life or even for a teacher to use in his/her classroom. One reader a chance to win their very own I Cherish Planet Earth game and book set! Tell me what you like about the I Cherish Planet Earth set and who you will be giving it to if you win. - Become a fan of Challenge and Fun on Facebook. This giveaway is open to US and Canada Residents 18+ only and will end on Tuesday, November 10th at 11:59pm EST. One winner will be chosen at random using Random.org. Winner has 48 hours to claim his/her prize otherwise a new winner will be picked. You must leave your e-mail address in all of your comment(s) so I can contact you. I will not share your e-mail address with anyone, it will strictly be used to notify you if you win. Good luck! Please note that the opinions and views expressed in this review are my own and based on my personal experience with the company and product. 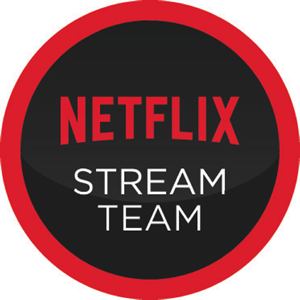 You may encounter a different experience with this company or their products than I did. I did receive the product mentioned above for this review. i like that its a GREEN game and i will give it to my grandson manne. I like that it gets people thinking about our planet and its people. I would give it to my son and his wife. I love that this is a game that you just don;t find at Target. It is something that will help our future generations learn about taking care of our future...our world. I would give it to my daughter, Hayden, who gets upset every time she sees trash outside on the road. "MOMMY DON'T THEY KNOW THIS IS NOT WHAT TO DO? THIS MAKES ME MAD!" she will say. Great promo and fantastic Blog! PS-I subscribed and am now following. I would love for oyu to check out the work I am doing in the name of green on my blog. I like that it makes caring for the environment fun! I would give it to my son. I like that it promotes learning about taking care of the earth in a fun way kids will remember. I love that it is green and that it is a fun way to teach my children about being green! I hope to use it to reinforce the values by which my Earth Savers Club at school are living. They love games and other fun ways to get the point across. I like that it teaches about protecting the environment. I'll give it to my kids. I would love to win this for my niece. It is so informative in a fun way. I love the affirmations and that the theme of being environmentally-aware and active is set in the first-person. I haven't come across this before in green-related books or other materials and I think it might have a much greater impact on a child. I would love to give this to my 5-yr-old nephew though his parents would probably scoff at it. So, I would keep it for my soon-to-be 4 year old daughter (and have her show it to/play with this cousin) ;). Thanks for the chance! I like the dual purpose - to help kids with their learning skills plus involve them with the environment. I would give this to my sister for her children. I love the fact that The packaging and materials are earth-friendly with a Cotton drawstring pouch to hold game pieces; Printed on recycled paper and cardboard with Vegetable-oil based inks! I would give this to my little ones and know that they'd surely love it! I Became a fan of Challenge and Fun on Facebook! I will be playing this with my grandchildren!! I love this game! It makes the wee minds think and is educational about everything "green". Brilliant! We LOVE matching games in our house! We definitely don't have any that teaches us something too so this would be great to win. My daughter would love it! I like the picture; for my niece Hannah! I like that its a GREEN game and I will give it to my kids. I love that it includes a love letter to the planet, so sweet. I love that it takes the classic game of concentration and gets our children thinking of the planet at the same time. I didn't mention who the game would go to if I won. It would go to my 5 year old son with the hopes he would share and teach his 3 year old brother. I love that it is a green game about the environment and I'd give it to my niece. I like that they use vegetable based inks and recycled paper. I'd love to give this to my daughter. I like that it teaches childreen about taking care of our planet through a game as well. I think it helps to have a more interactive approach to teaching children. This would be for my 5 year old daughter. I would give this to my son for Christmas. I like that it teaches respect for our planet. I like that it encourages kids to care about the earth. I like how the I Cherish Planet Earth set encourages kids to care about the environment. I became a fan of Challenge and Fun on Facebook.